התחלה החכמה האלקי כפי דרך האר″י. f. 1r-35r: Hathalat ha-Hokhmah ha-Elokit. f. 36r-38v: Several kabalistic annotations. 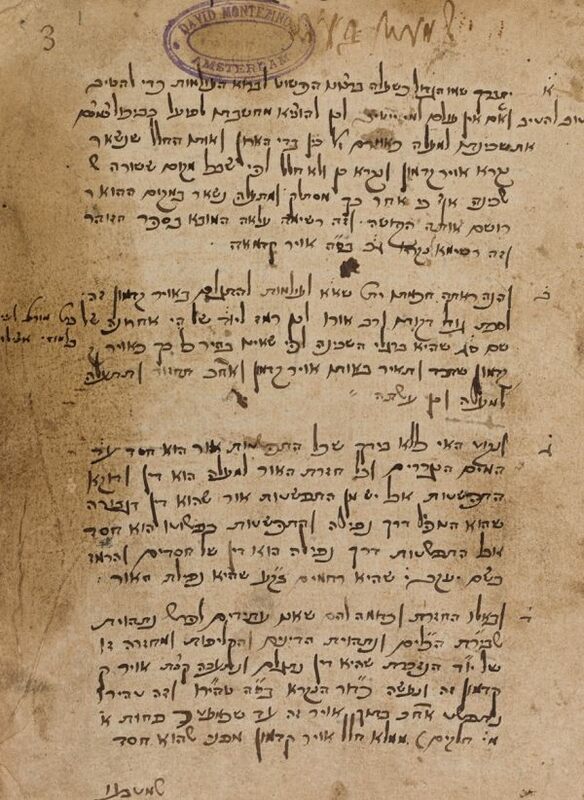 f. 39r-98v: Yonat Elem by Menahem Asariah of Fano (100 chapters). f. 99r-121v: Kabalistic annotations by Moses Basola of Livorno. f. 122r-130v: Sha’ar ha-Milu’im by Isaac ben Solomon Luria. f. 32r-138r: Birkat ha-Levanah, the blessing of the new moon. f. 13 v-141r: Seder ha-Atzilut by Isaac ben Solomon Luria written down by his pupil Simon Ashkenazi. f. 141v-151v: Commentaries and homily with annotations in the margins. f. 152r-207r: Sefer Limude Atzilut by Israel Baruch with later commentaries in the margins. The first treatise was printed for the first time in Amsterdam in 1652 as Sefer Ma’ayan ha-Hokhmah; the second treatise was published in Sefer Asarah Ma’amarot (Amsterdam, 1648). Hebrew / Paper / 19,3 x 16,1 cm. /  ff. / Variety of lines to a page / Ashkenazic cursive writing / Title written on top of f. 1r / Some catchwords at the bottom of the pages.